Newtown Radio is taking it to the streets. 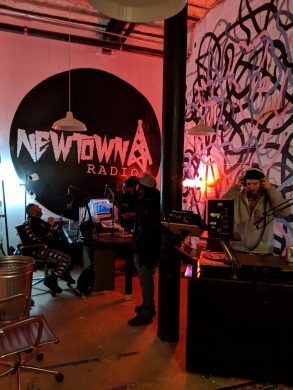 The eclectic internet radio station just moved to a ground-level space that’s expected to give it more visibility in East Williamsburg and more room for art and music shows. Founded in 2009, Newtown had been broadcasting out of a practice space hidden in the Danbro Studios building, a former brewery off the Montrose stop that now houses rehearsal studios. After a week off the air, the station has now moved down to a street-level storefront there, at 260 Meserole Street. The pet project now works with about 60 or 70 volunteer DJs who spin everything from new wave to Nigerian, including selectors from local spots like Spectacle Theater and feminist witch boutique Cult Party. After a 10-month buildout, the new space, Brinda said, has a massive wall for displaying artwork (there’ll be an opening next Friday for artist Michael Yinger) and bleachers for watching shows. Friday evenings after 9, the station’s DJs can book the room for their own purposes. Upcoming events include a launch party hosted by Dali Haus, an album release and listening party hosted by Bliss Point, and a one-year anniversary hosted by Buttered Tapes. In addition, Masha Koblyakova and Lenora Jayne will offer regular educational sessions for female DJs who want to learn how to spin but don’t have easy access to equipment. Eventually, once the station upgrades its website over the course of the next months, shows will be video-streamed in a manner similar to that of another North Brooklyn internet station, The Lot Radio, which is currently broadcasting from a Times Square popup. Tune into Newtown Radio here.